We are amongst the renowned manufacturer, supplier and exporter of best quality array of Antioxidant Capsules. These antioxidant capsules are highly appreciated for its premium functionality, excellent chemical composition and cost efficiency. Our organization is amongst the leading manufacturer, supplier and exporter of top quality array of Antioxidant Metroforce Capsules. These antioxidant metroforce capsules contain excellent combinations of Antioxidant Cap, Betacarotine, Vit A, E, C, Selenium Dioxide Element and zinc. Our antioxidant metroforce capsules are ideal for combating free radicals which are great contributor for various diseases and body disorders. 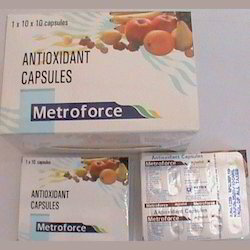 We are offering fine quality antioxidant metroforce capsules at economical range of prices.